I can't believe I am typing these words but there is a possibility of yet another tropical storm or hurricane forming, this time in the Gulf, in the next few days. Update below!! 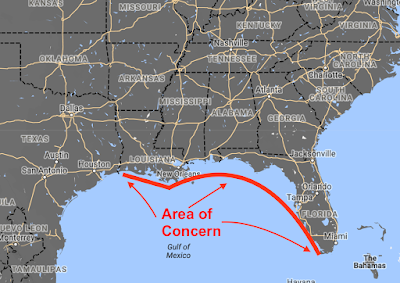 We are not able to narrow the threat area down much more than what I have outlined above which is essentially from Sabine Pass to Naples. At this point, I don't see Texas being threatened. The timing of the threat is Saturday night-Monday (again, can't narrow it down much). If I lived along the Gulf Coast in the area indicated, I would refill any drug prescriptions. If you depend on a drug that requires refrigeration, I would insure that I had a way to keep it chilled in the event of a power loss. Infirm friend or relative? Make sure there is a way to care for their needs in case a storm develops. That is about it at this point. I will have another update this evening. Stay tuned. Additional information: The National Hurricane Center has decided to begin advisories on this weather system, somewhat earlier than I thought they would. This implies they see this as a threat. I'll post again after their advisory is out.